iOS 11 gained a reputation for being sometimes slow and buggy, making it feel like an incomplete product to a lot of users. Even Apple seemed to acknowledge that it didn’t quite hit the mark with iOS 11, and promised earlier this year that its next installment of iOS 12 will settle the score by paying extra-close attention to speed and overall system-wide performance enhancements. Yesterday during its WWDC 2018 keynote, Apple executives officially took the wraps off iOS 12, which not only touts a host of new features like redesigned App Stores, Memoji, and FaceTime group calling, but also promises sizable, system-wide performance enhancements in the way of quicker app launching, smoother scrolling, greatly improved stability and much more. According to Apple’s own verbiage, iOS 12 improvements will come to the benefit of features like smoother animations, faster app launches, faster keyboard display, improved typing speed, latency, accuracy and more. “App launch is up to 40% faster and up to 2x faster under load,” according to Apple’s statistics. The default iOS keyboard should appear roughly 1.5x faster, offering more responsive input. Apple also claims that activating the camera from the iOS lock screen should be about 70% faster on older devices like the iPhone 6 Plus. For iOS 12, Apple said it tuned and recalibrated the way its software works with hardware at the CPU level, making the SoC faster while also taking advantage of its proprietary A-series silicon design. Specifically, Apple noted that with iOS 12 it’s paid particularly close attention to older devices like the iPhone 5s, iPhone 6 and iPad mini 2 & 3. As such, the newly unveiled iOS 12 runs, and is expected to generate substantial improvements on, a wide range of Apple devices including all models capable of running iOS 11. While Apple showcased iOS 12 yesterday and released the first beta 1 build to developers for testing, this build is far, far from the complete, bug-free public release that’s not expected until later on this fall. Still, as it has in years past, Apple releasing iOS # beta 1 has already given us insight into what we can expect — sans all the performance and stability fine-tuning that will accumulate over the summer ahead of the official public release. In the video below, we’re offered a rare and encouraging glimpse of just how much potential iOS 12 has. The clip, provided courtesy of iAppleBytes, shows off two iPhone 5s units side-by-side — the left-hand model running iOS 11.4, and the right-hand model running iOS 12 developer beta 1. While it’s certainly important to keep in mind the naturally buggy and unpredictable nature of beta 1 software builds, it’s also quite refreshing to note that in most instances, the iPhone 5s running iOS 12 beta 1 performed noticeably better with faster app launches, fewer dropped frames when scrolling, much improved keyboard performance, and much more. Fascinating, isn’t it? What’s most interesting of all, is that in addition to ramping up speed and performance on older devices like the iPhone 5s and iPhone 6, iOS 12 also shows promise with regards to improving the performance of newer Apple devices like the iPhone 8, too. 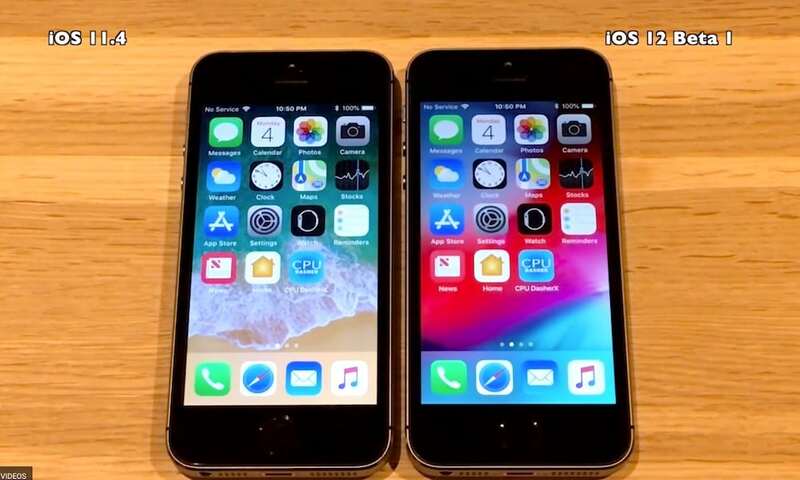 You can get a glimpse of that action in the second video below, where YouTuber iUpdateOS performs a similar side-by-side comparison using two iPhone 8 devices running iOS 11 and 12, respectively.